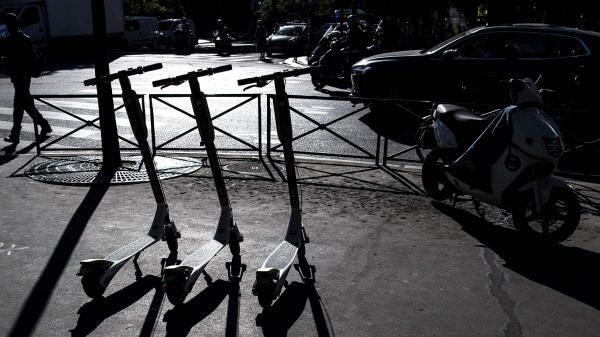 Electric scooters are pictured on a sidewalk in Paris in June 2018. Multiple companies offer the small vehicles for rent by the minute in cities around the world, including many in the U.S.
On a recent evening, he sees two scooters up for grabs just around the corner from his office. He hops in his Subaru Impreza and starts collecting. Electric scooters are hot right now. Lime and Bird, the two biggest companies, are valued at some $2 billion each. You can rent scooters by the minute from one or both companies in more than 100 cities across the country — from Abilene, Texas, to Tacoma, Wash.
And both companies rely on independent contractors such as Kirzner to keep the wheels rolling, by taking the scooters to their homes and charging them in ordinary outlets. In the process, chargers fulfill another key need: They help move scooters from out-of-the-way locations to hot spots where they'll find more riders. Lime calls the chargers "juicers." Bird has its own puns: The chargers "capture" Birds, and then release them to "nests" — specific locations chosen by the company — in the morning. This is largely nocturnal work: Some scooters don't become available for charging until after 9 p.m., and they're supposed to be back on the roads early the next morning so they're available for commuters. 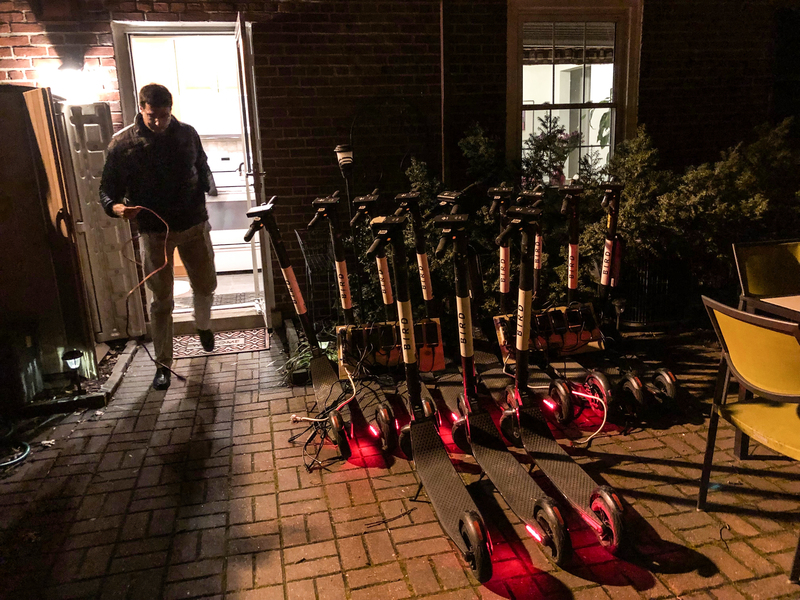 Starting after sunset on a recent chilly night, Kirzner collects 12 scooters in quick succession near his office building before heading home to charge them. He's collecting Birds tonight — there were more available than Limes — and earning $4 or $5 for each, including a bonus for collecting multiple scooters. The bounty offered per scooter varies based on location, level of charge and how long a scooter has been standing idle (a sign it might be in a less-desirable location). And in general, the bounties have gone down over time. For instance, Bird used to pay up to $20 for scooters that had been waiting the longest. But unscrupulous chargers would take scooters off the street and hoard them while their value increased; now, Kirzner says, $20 for a charge is all but unheard of. The declining rates have reduced some of the previously fierce competition to snag scooters. Many people just aren't willing to hit the road for smaller payouts — especially on a cold, windy March night. Andy Castillo, who used to collect Lime scooters in Washington, D.C., isn't charging anymore. He used to go out with his mom, who's retired — "it was a way for us to spend time together," he says — and they'd fill up his pickup with scooters. "When I first started, it was $6 a scooter," Castillo says. "They lowered the price recently to $4, and I did it once or twice after that and it wasn't as exciting." Kirzner says it's still worth it for him to charge, especially since he rarely goes out of his way, collecting and redistributing right near his office and his home. "It's like picking money off the street," he says, when he finishes one pickup and spots another scooter, worth $5 per charge, available just across the street. Joel Kirzner charges Bird scooters on his patio in Arlington, Va., on March 4. He routinely picks up scooters after his workday is finished and charges them overnight for the companies Bird and Lime. Of course, it's not that easy. Once they're all stacked in his hatchback — he has a very precise system for squeezing in up to a dozen Birds — he takes the scooters home and plugs them in on his patio. His chargers are neatly organized, mounted to pieces of plywood with color-coordinated zip ties. They'll charge for hours, and he pays for the electricity. (The effect on his electric bill is negligible, Kirzner says.) The next morning, he'll wake up early to get the scooters out on the road, deposited in locations preselected by Bird, before he heads to his day job. Kirzner says that since he started charging in September, he's earned more than $9,000. He also cautions that this job is not very reliable — not like, say, driving for Uber or Lyft, or other options in the gig economy. Some nights he might come up empty-handed. And in some cities, Lime or Bird have folded up shop and disappeared overnight. It's also not clear if the companies will continue to rely on contractors. Other companies, such as Lyft, use employees to charge their electric scooters. Kirzner wonders how it can possibly be cost-effective to pay him $50 or $60 for a couple hours of work that a full-time employee might do for $15 an hour. More speculatively, some analysts suspect robots might be coming for these jobs — robot scooters, that is. "What people are talking about already is having these things be autonomous," says Horace Dediu, the influential analyst who coined the term "micromobility" to describe small electric vehicles like scooters. A three-wheeled or self-balancing scooter could "crawl around on the sidewalk at, like, 3 miles an hour," he says. "Maybe during the night they'll reposition themselves to a charging station. Now, either you have a person there who plugs them in, or they could hover above what is essentially an inductive spot ... so they could self-charge." "So you'll have these these sort of armies of scooters rolling around the city at night roaming to try to find a charging station," Dediu theorizes. "I think that's not crazy as it sounds." After all, payouts to chargers such as Kirzner represent a substantial cost for the scooter companies — which are still burning through money as they expand, and haven't yet managed to turn a profit. But for now, chargers play an integral role in the scooter economy. In the chilly darkness, Kirzner carries his night's haul from his car and neatly lines them up. He says he makes decent pay at his 9-to-5 job. But a side hustle helps, he says. "I have expensive rent, expensive car payments, cable bills," he says. "You talk about the disappearing middle class — I feel like I'm in that zone where I can live fine, comfortably. But if you want to have a little more financial stability, this definitely helps." And he'd rather do this than drive for Uber or Lyft, he says. It puts fewer miles on his car — and there are no drunk people to deal with. "The Birds don't talk back to me," he says. "They tweet every so often — you know, beeping — but other than that, they're pretty nice." ALOE BLACC: (Singing) Hey, hey. Well, I need a dollar, dollar. Transcript provided by NPR, Copyright NPR.